First thing to get clear, this is a story about Trinidad, Cuba….not Trinidad & Tobago! Most articles on Cuba seem to concentrate on Havana but it was Trinidad, on the other side of the island, that won me over. Trinidad still has a similar patina to Havana, vintage cars, cheap cocktails and cigar sellers on the street, but there is a real charm and vibrancy to this colonial town which I didn’t quite find in the big city of Havana. There are also plenty of cowboys still riding around…and who doesn’t love a cowboy? After arriving at the airport in Havana, my husband & I were driven across the island in a 1949 Chevolet, with no suspension and all windows open for air-conditioning. I lied to my husband and told him that the trip would only take a couple of hours. Four hours later we arrived slightly windswept but having seen the beauty of rural Cuba where tropical fruit crops are plentiful. I loved every minute of it and in the end it seemed to me the right way to arrive in Trinidad. Looking for a more authentic accommodation option, and being generally disappointed with other options, I had booked a room in an Airbnb in the centre of the town. This enables locals to prosper and allows a glimpse of everyday life in Cuba. It was located within easy walking distance of the main town square and meant we got to appreciate the town at night when many of the day trippers had returned to Havana. The beauty and historic significance of the town was officially recognized in 1988 when it was listed by UNESCO as a World Heritage site. It’s colonial architecture and cobbled stone streets have been well maintained. What attracted me most to Trinidad is that it is a town where you can just wander and explore without any itinerary or destination. To me it was more about seeing what life was like in Cuba rather than visiting specific sites or doing particular activities. I did hear wonderful stories of horse riding adventures and trips to the nearby beach but the cobble stone streets of Trinidad were a greater attraction. 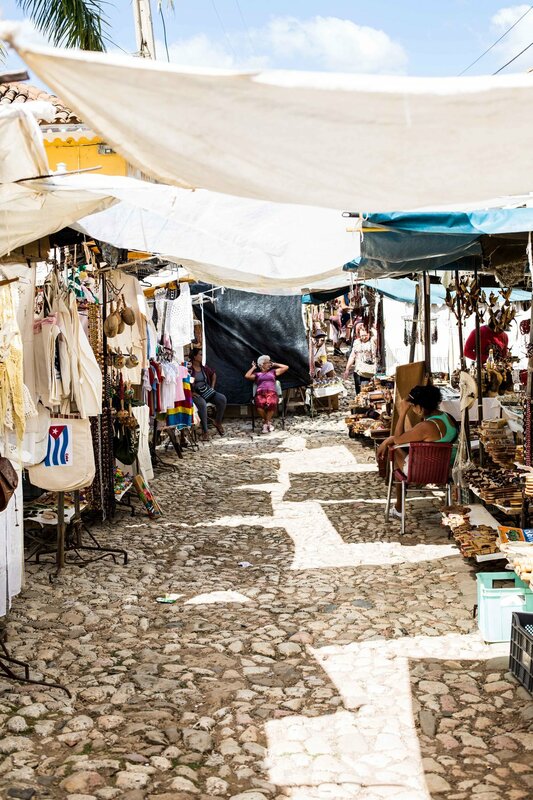 As a market lover I thrived on the many streets filled with artisans selling local crafts including woodwork, embroidery, jewelry and paintings. In fact we found shopping here much more pleasurable than Havana. What really made me smile was the music. On the streets, in the restaurants, or coming from the open windows as you passed private homes, music was everywhere. It is difficult not to feel happy when you see Cubans dancing at the Club Amigos del Danzon. Our two evenings in Trinidad were spent sipping cheap cocktails, watching the sunset from a roof top bar, and dancing to the Latin beat...and I loved every minute.